August would have liked to see the exchange between astronaut and aquanaut, but it was a liking he felt but dimly. Partly this was because he was tired, so very tired, and in the final stages of life, and he thought he could no longer feel wanting for himself. He was so tired, and his bed so comfortable, that if the ravens could have again told him where they would have taken him and left him to dream it would have been enough. But there was another reason beyond that, for August had begun to understand that the conversation he thought he had missed was one that he had been having all along. Instead of the ocean, instead of the atmosphere and a hard sliver of space, the state of death lay between him and the ravens as a refractor, and they had been talking across it for near the whole of August. The month that had begun with Caroline and reflection, the harbinger of his own death in a streaming comet, was ending with refraction, with conversations that bent around, that looked different from either side. So when Huginn and Muninn came to his bedside for the last visit but two, August went without complaint, and trusting. “I am sorry if you are disappointed,” said Muninn in their flight, and her voice rumbled through the iron, vibrating through feathers and into bone. “It’s alright,” said August, and it was. “There is no hope for me,” said August. He did not say it with a sudden painful awakening, or a clutching at straws he couldn’t yet comprehend. Instead, there was certainty and kindness both, for Muninn had become his friend and although she would remember him friends missed each other when they were gone and felt bad, didn’t they? He didn’t want her to grieve, or to cling to something other than the inevitable. She had taught him that. “I did not say the hope was for you,” said Muninn, and had August the strength he would have laughed, to find her still so very honest. She had always been honest with him, more honest than anyone he had ever met, although sometimes the honesty hurt him. And then they were winging down into a great city, stretched far in every direction and August couldn’t see the end of it in the dark, though the sun was coming up. In this great city was a great building, and in that building was a giant room full of echoes and emptiness. It was set up as a school, almost, August thought, with rows of desks and a lectern in front, and it was entirely empty. And August, who remembered war and fire and shadows all together, shook his head. “No wonder it’s empty,” he said. “What am I missing, Muninn?” said August, who did little else but sleep now and who had a celebration coming that he had tried so hard not to miss. 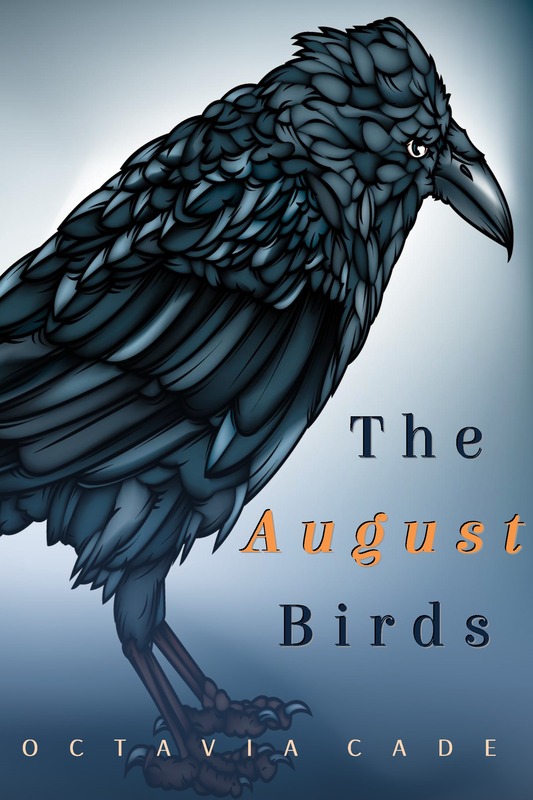 “Huginn can show you that better than I,” said Muninn, and August shuddered in fear and anticipation both. He remembered the sharp stab of the raven’s beak, cold in the centre of his forehead and too close to his eyes for comfort, the beak of a raven who swung over a burning city and came down to pick the eyes from the dead. But he remembered too the beauty of it, the information, the golden network, and if Muninn had shown him comfort over the past month, shown him reconciliation, then Huginn had shown him beauty. And he had, Muninn said, wanted to show him hope. That August could not understand. Huginn had never shown a liking for him, never wanted to share or be friendly. He had never cared if August were sad, or afraid. What hope, then, could he give? There was only one way to learn. August took a deep breath, as deep as he could although it hurt his chest to do so, and squared thin shoulders. “I’m ready,” he said, and again Huginn came towards him, that black gleaming beak born before him and buried, growing larger and larger in August’s eyes until he could see it no longer and other visions were before him. There was the same blood-wash, the same strange mix of feather and bone, a skeleton and a seeing imposed upon his own and August was in the same giant room, the same school-yard and it was limned about the edges and gold, and full of people. Between them were spider-webs, the same light lines connecting them to each other, to the past and future, and as each person at each desk cast their vote the light between them brightened, strengthened, and although it was gold it was also violet tinted and August felt himself pulled along the violet and into a past that he had seen before, a ruined city that held his ruined self, with the scent of roasting flesh in the air and shadows burnt into stone. “No!” he cried. “I don’t want to come back here!” And he was shrieking then, as loud as he could and wordless, a shrieking that sounded like bombs and turning back and the dissolution of family and April’s face as he turned away from her, the small distressed noise that she had tried to hide, the sound of a door slamming behind her. Then the part of him that was Huginn took over and August felt as if he were snatched up suddenly, snatched up into spirals and he beat his fists against the snatching with strength he didn’t know he had still, and those gold-violet beads were before him again, and stretching. There was another bomb, as bad as the first and a second ruined city, and there were tests and developments and islands blown to ashes, islands leaking radiation, and there was a site on a steppe that leaked as well, leaked into local populations of more than fish and mammals and seaweed and it was all covered up, this site that burned first on the 29th of August and burned for more than forty years. The part that was August screamed and screamed, and in his desperation he felt in the golden spider-web about him a strand that spoke of home, and he followed it as best he could, grabbed hold with mind and heart and dragged the raven with him until those shining strands coalesced again in a group of islands at the bottom of the world. And there those strands split into rainbows and protest marches and sinking boats, into betrayal and bombings and songs as letters, a government brought down, into a nation who spoke one word together and that word was No. And the strands furled off into Chains and broken treaties and consequences, into the totalitarianism of friends and moral indefensibility, as David Lange spoke at Oxford and Marilyn Waring crossed the floor and boats were not sunk but turned away in peace and left to their disagreement. And that coalescence was a hub of its own, with its own golden spokes, and those spokes were not of people but of countries who came together to say their own no, countries and treaties and free zones, Raratonga and Pelindaba, Bangkok and Semei and Tlatelolco, Mongolia and Kazakhstan. And Kazakhstan, who had the testing and the ending of tests on the 29th of August, came unto the General Assembly, and argued for making that day an international one, against all tests of that kind and August was pulled back into that room, the time he saw it second and full of people, interconnected. And when Huginn pulled his beak from August’s forehead, it was after he had seen them all voting for it, one after another, like dominoes, and the debate and discussion and consequence of that action, the exchange of ideas, burst out before and aft, as it had, if he had but seen it, at Hiroshima. And Huginn, meatless, without eyeballs to pluck in a school room empty that day of war, beat his wings until he soared in circles above the desks, above the lectern, and August knew then a little of what he was seeing, ideas and ideals together, and both from the same source. “Does that work?” said August. His mouth was dry and he felt a little dizzy. “Is it going to be enough?” said August, sitting in that great, giant room stamped at the focal point with olive branches, and because Muninn had his memories she had no need to ask, for she knew he meant the days and the treaties, the cessation of burnt stone and burning meat. “Do you believe it is enough?” she said, and August considered. “But you would like to go home now,” said Muninn. Tune in tomorrow for the next chapter, wherein August is taken back in time to see the birth of Ernest Rutherford!